Bob Pelkey and I headed down to The Keys to look for several specialities that make a home in the Keys. Also hoping that we could come across any vagrants from the West Indies. Like the Antillean Short Eared Owl or the Bahama Mockingbird recently sighted in Key West. Actually we are at least a month late for the best spring-time birding. But logistics delayed us till late June. One positive was that June is a slow time for tourism making travel a lot easier. We arrived in Key West at sunrise to the sounds of crowing chickens and calling White-eyed Vireos. Ft Zachary Taylor State Park was our first stop were we quickly tally White-crowned Pigeons, Magnificent Frigatebirds and a Great White Heron ( the white morphed form of the Great Blue Heron). A short-eared owl had recently spent some time here was now long gone and a recently reported Bahama Mockingbird was also not located. Just saw a report that the day following our visit a smooth-billed ani was seen. We then made several stops in the lower Keys to find and photograph several Black-whiskered Vireos, Gray Kingbirds, more White-crowned Pigeons and the famous diminutive Key Deer, a sub-species of the white-tailed deer. At Bahia Honda State Park we added Least Terns, Black-bellied Plovers, Wilson's Plovers, Semipalmated Plovers Ruddy Turnstones and a trio of Killdeers. 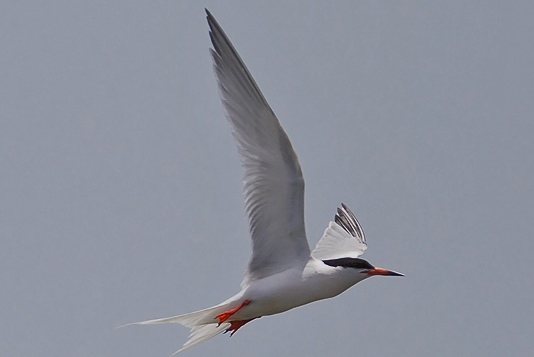 By the early afternoon we had arrived in Marathon and located a flock of a least twenty beautiful Roseate Terns in their best breeding colors. Bob noted in his photography that several were banded. I noticed a strange little lizard that I found was a Northern Curly-tailed Lizard which originally came from the Bahamas. After a muched needed break we later regrouped at the Marathon Airport to await the arrival of a pair of Antillean Nighthawks. Before their arrival we watched several birds working the wet areas at the west end of the air strip. They included Laughing Gulls, Black-bellied Plovers, a dozen Short-billed Dowitchers, a trio of Black-necked Stilts, White Ibis, a Glossy Ibis, Grackles and Starlings. From Marathon we headed back toward home with stops at Long Key State Park, John Pennekamp Coral Reef State Park and Dagny Johnson State Park. Not much new was added with these stops except for Bob's success in photographing a Mangrove Cuckoo, which later review turned into a Yellow-billed Cuckoo, at Dagny. I dipped on the cuckoo as it flew of before I could get a look. We tried to investigate the mangroves at the Card Sound Road tollbooth for cuban yellow warblers, but the deer flies drove us to quickly retreat to Bob's car. In Homestead we added Mynah birds. At this point we bailed on heading over to the University of Miami campus for parrots and other exotics. Instead we took a quick run over to the Lucky Hammock area outside of the entrance to Everglades National Park. Here we added Swallow-tailed Kite, a sleeping Common Nighthawk resting on a telephone line and a calling Northern Bobwhite sitting in a tree. Here we ended the trip and headed back to Ft Myers. Our over-all count, as expected for this time of year, was low, but we did find all but one of our target birds on this trip. Plans are to repeat again next year in May and to add a trip out to the Dry Tortugas.